The Company was formed in 1977 to make fully ergonomic keyboards and has been doing so ever since. Our success in so many RSI recovery cases confirms our claim to lead the world in ergonomic keyboard design. The company was founded by Stephen Hobday as a result of a meeting between himself and Lillian Malt when Stephen Hobday became intrigued by the issues surrounding the use of the Scholes Qwerty keyboard layout. At the time Stephen was running Printed Circuit Design Ltd. (known as PCD), a small business in Farnborough Hampshire making electronic equipment. Stephen was interested in sourcing some new products to manufacture, and it just so happened that a local company had asked him if he would be interested in making them a computer keyboard. This led to discussions with Farnborough Technical College about the design of the keyboard, and in turn to the meeting with keyboard training specialist Lillian Malt who had been closely involved with the printing industry retraining Linotype operators to use computer keyboards. The first keyboard, (top image), was shown at the News Tec exhibition, Brighton, in December 1976 and created a big stir and a lot of interest from potential clients. The Company, PCD Maltron Ltd. was formed to cater for the demand and offer the benefits of their unique product to a greater number of people. 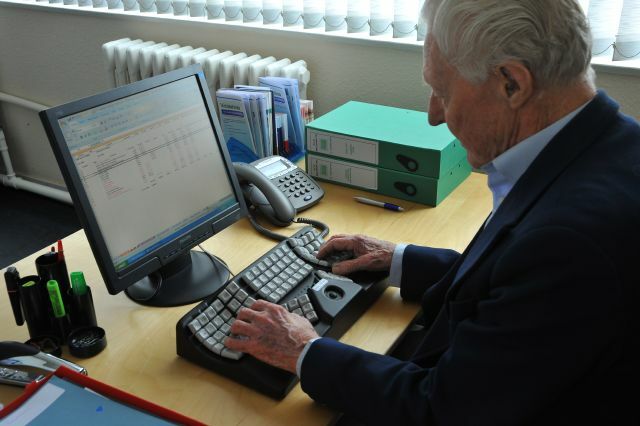 Since its inception PCD Maltron has continued to develop their fully ergonomic range of keyboards that can be used with any PC or Apple computer. The second image shows the Single Right Hand Keyboard while the bottom image is of the updated original 3D dual hand keyboard with integrated trackball (optional). We make fully ergonomic Maltron keyboards two handed, left and right single handed, one for head or mouth stick or single finger use and an expanded keyboard with recessed keys for helping in cases of cerebral palsy. The two handed Ergonomic 3D keyboard is effective in reducing the strains causing keyboard RSI problems. So much so that we have had the pleasure of getting many hundreds of sufferers back to work by using it. We also make a version of the keyboard with a built-in trackball and sell ergonomic mice. These can help with mouse-related RSI in many cases.